My love for brownies is directly proportional to V’s un-love for them. I really wouldn’t call it hate, coz he enjoys them quite a bit with whole works – sizzling, warm with scoop of ice-cream and meting in the mouth chocolate sauce. Who wouldn’t?? But I enjoy them just as much without the jing jang. I like them for chocolatey taste, for being dense and for being laden with walnuts. That’s me, I guess. When Priya left for her hometown a couple of months ago due to an emergency, she cleaned her fridge and gave me loads of veggies. I am not a great fan of cucumber and here our un-love matches, even V doesn’t like it. I had roughly 8 cucumbers to use. 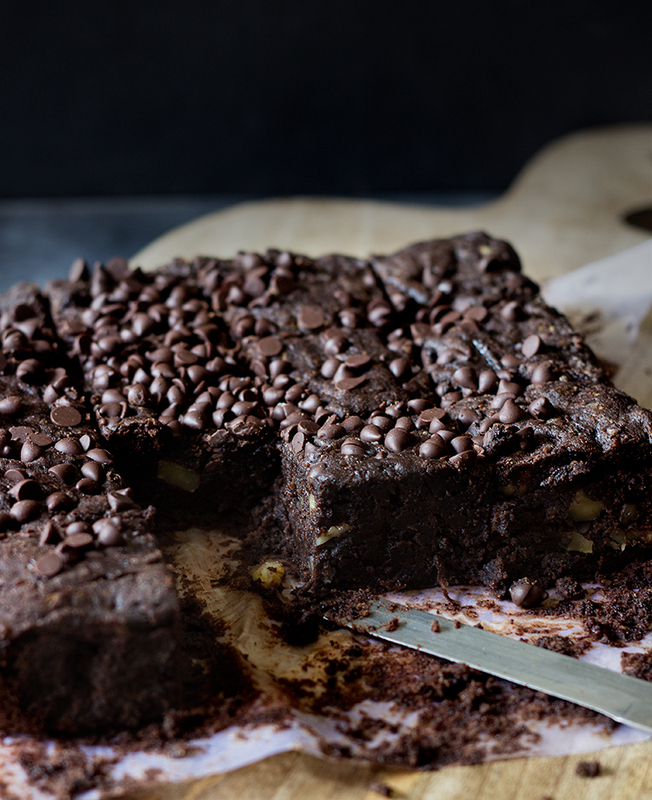 You can imagine my dilemma, so I did what I do best – converted those cucumbers into gooey, decadent brownies. I followed my basic recipe which I always fall back on here and whole wheat version here. If you have any ingredient which you want to use and are stuck, leave a comment I might be able to help you create a recipe which everyone in your family will love. 1. In a small bowl whisk together the water (3 tablespoon) and flax meal. Let it sit for about 10 minutes till it becomes frothy. This mixture is called flaxseed egg. Coat the chopped walnuts with little flour to avoid sinking to the bottom. In a medium bowl whisk together flour and baking soda. Keep aside. 2. Preheat oven to 180°C. Line & grease an 8 x 8 inch baking dish. Allow overhang on all sides for easy lifting of brownies after baking. 3. In another medium bowl add the cocoa powder, chocolate, coffee and salt. Add boiling water and mix in the ingredients into a paste using a spoon. Make sure that chocolate pieces are melted. Add jaggery powder, butter, vanilla extract and flax meal egg into the chocolate mixture until smooth. 4. Stir in the walnuts if you're using them along with grated cucumber. Using a wooden spoon, mix in the flour until well combined. The mixture becomes extremely thick and you may need to use your hands to mix. Don't mix the dough with an electric mixer at this point. It will overwork the dough and gluten will form, in turn affecting the texture of the brownies. 5. Transfer the batter to the baking dish, using a silicone spatula press the thick dough into place. Bake for 30 minutes. Cool on a wire rack for an hour. Transfer the brownies to the wire rack by lifting the overhang. Allow them to cool completely before slicing into squares. 6. Serve with powdered sugar or ice-cream or sauce or eat them off the rack. Enjoy! Second is to allow them to cool completely (no matter how tempted you are) before slicing. Also use a plastic knife and not a serrated knife. I use the cheap plastic knives which are given with store-bought cakes.